Should Facebook be your New Corporate Home Page? When you look at the numbers it’s hard to make a case against this strategy. 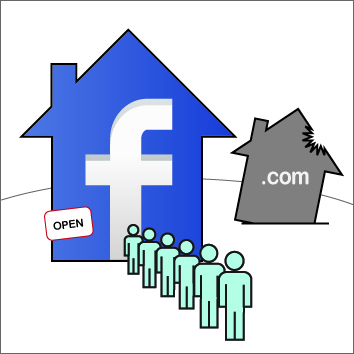 Facebook alone has more than 800 million members worldwide, including 18 million Canadians, half of which login on a daily basis. They’re spending an average of 21 hours per month on Facebook and corporate branded pages get 70 million new Canadian fans each month. Numbers don’t lie and they’re huge! But I’ve got to be honest, placing all your emphasis on social sites like Facebook and YouTube scares me a little. Don’t get me wrong, I think you should have a significant presence on these platforms. You should be participating and dedicating resources to maintaining them. But it’s important to recognize that you have very little control over the customer experience, privacy and not to mention a consumer’s primary purpose on these sites is to socialize. What do Canadians have to say? We asked more than 1,000 Canadians, via AskingCanadians™, the following questions: When you think of your favourite brands, where on the web do you tend to visit the most? Is it the corporate-branded website? Is it their corporate-branded social media sites? Or, is it a third party consumer-led social media sites? Corporate-branded websites came out on top. A very close second was the consumer-led or consumer-generated sites (e.g. blogs). Dead last was the branded social media site. A couple of reasons why: the lack of trust and poor customer experience on today’s social sites. Customer experience will improve over time as brands learn to work within these new emerging platforms and create seamless customer experiences. But building trust is a whole other ball game. People are still very cautious about the information they consume on social media sites, even branded ones. They trust the information on a corporate branded site. Why? Because of the detailed privacy, legal and security policies. Not to mention the brand is in control of the end-to-end customer experience. Yes, believe it or not customers do want the brand to maintain some control. At the end of the day your corporate website is still the work horse behind driving real business. It’s the backbone of your online ecosystem by providing a seamless end-to-end customer experience, capturing customer data in a secure manner and controlling the total brand experience. Facebook is part of the digital ecosystem, absolutely. It’s a big part of the total customer journey. Branded Facebook pages and YouTube channels are essentially taking the place of the traditional campaign microsites. And, you can create rich, engaging and highly interactive experiences within them. Your corporate website is not dead, despite all the rhetoric claiming it is. And Facebook and other social sites are powerful tools. You need to develop a digital strategy that focuses on your customer’s needs, wants and desires then develop branded digital experiences (website, social and mobile) around them.